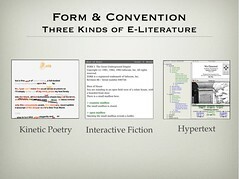 While still a student at Cambridge, I was invited by Adrian Poole to deliver a lecture to the final year English undergraduate students on the subject of "Tragedy in Electronic Literature" -- as part of the faculty's English Tripos lectures, which are normally given by faculty.. In advance of the lecture, Clare Hooper and I chaired a related panel at the 2007 annual Hypertext Conference. Panelists were Nick Lowe (Classics), Kieron O'Hara (Philosophy), Dave Millard (Computer Science), and Emily Short (Writer and Classicist). While listening to my talk, students could also browse a single-purpose WIFI network with additional notes and resources. 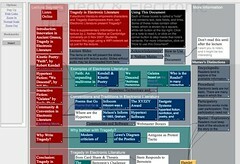 The lectures notes for "Tragedy in Electronic Literature" are now available online.